From coffee, to olives, to spices, Club House has always focused on the finest foods. 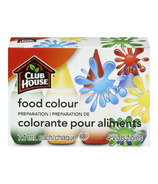 Strict standard of quality, freshness and taste have brought Club House to where they are today. Putting the best foods on your table is their ultimate goal.